Arundel: Being The Recollections of Steven Mason of Arundel in the Province of Maine. Garden City, NY: Doubleday, Doran & Company, Inc, 1930. First edition of “America’s greatest historical novel.” Octavo, original cloth, pictorial endpapers, top edge red. Near fine in a near fine first issue dust jacket with light rubbing to the extremities. Jacket design by Stafford Good. A sharp example. 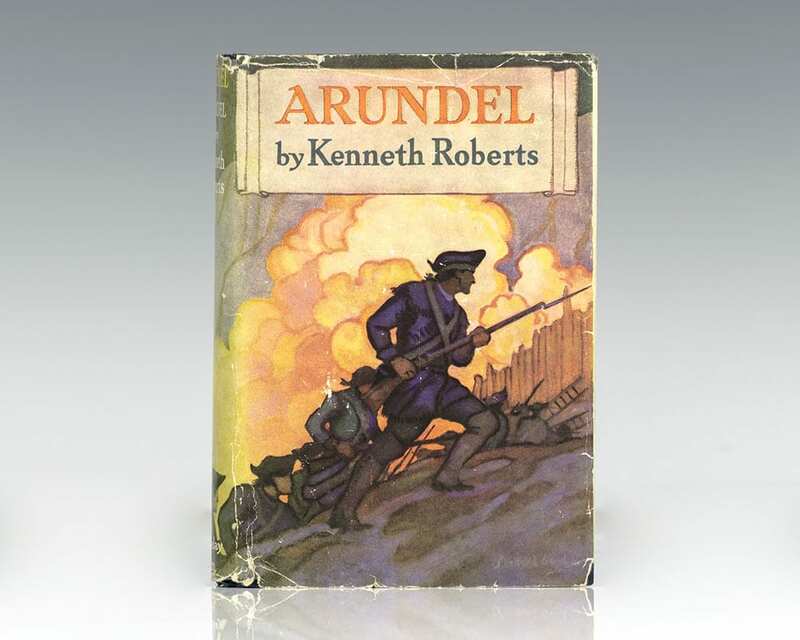 Ranked as one of the best historical romances of all time, Kenneth Roberts' Arundel is a masterful retelling of Benedict Arnold's secret expedition to attack Quebec city during the American Revolutionary War. 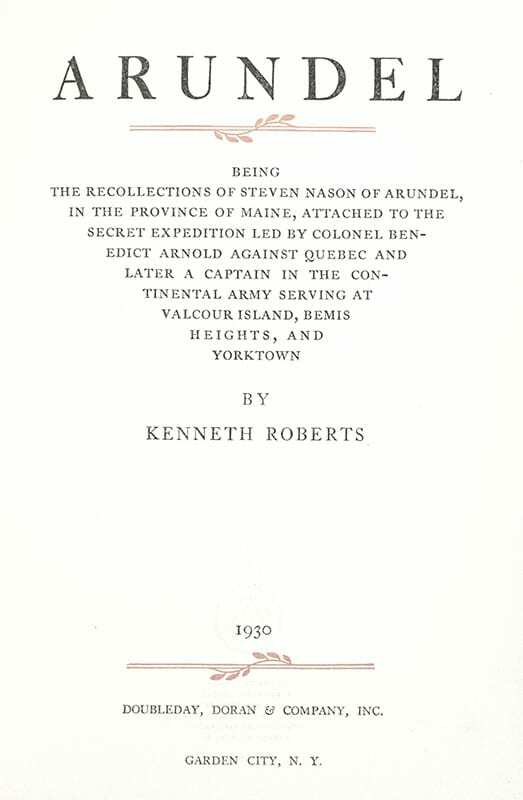 The novel's primary characters hail from Kennebunkport, Maine (then called Arundel), where the Roberts himself was born in 1885. The second invasion of Quebec, the expedition took Arnold and his company through a difficult passage in the Maine wilderness in which 300 men turned back and another 200 died en route. Garden City, NY: Doubleday, Doran & Company, 1937. First edition of Kenneth Roberts’ historical novel which follows the exploits of Robert Rogers, the leader of a colonial force fighting with the British during the French and Indian War. Octavo, original cloth, pictorial endpapers. Signed by the author on the title page, “With all the good wishes of Kenneth Roberts.” Near fine in a very good price-clipped dust jacket. Jacket illustration from a pastel by Winold Reiss, based on an original engraving of Major Rogers. Bookplate. Housed in the original slipcase which is in very good condition and a custom cloth clamshell box. Signed limited first edition of Kenneth Roberts’ work of historical fiction on the American Revolution from a Loyalist’s perspective, from the Siege of Boston to the United Empire Loyalists. Octavo, two volumes, original cloth, pictorial endpapers, frontispiece to Volume I, top edge gilt, other edges uncut. One of only one thousand and fifty numbered copies signed by the author. This is number 264. In near fine condition. Housed in the original publisher’s slipcase. Kennebunk, Maine: Kenneth Roberts Centennial Commission, Inc, 1985. First facsimile edition of “America’s greatest historical novel.” Octavo, original cloth, cartographic endpapers. Fine in a fine dust jacket. Jacket design by Stafford Good. First signed limited edition of Kenneth Roberts’ historical novel which follows the exploits of Robert Rogers, the leader of a colonial force fighting with the British during the French and Indian War. 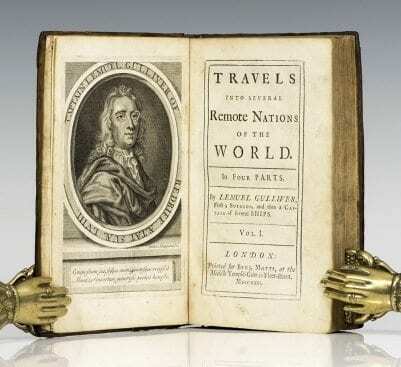 Octavos, 2 volumes, cartographic endpapers, top edge gilt, other edges uncut. 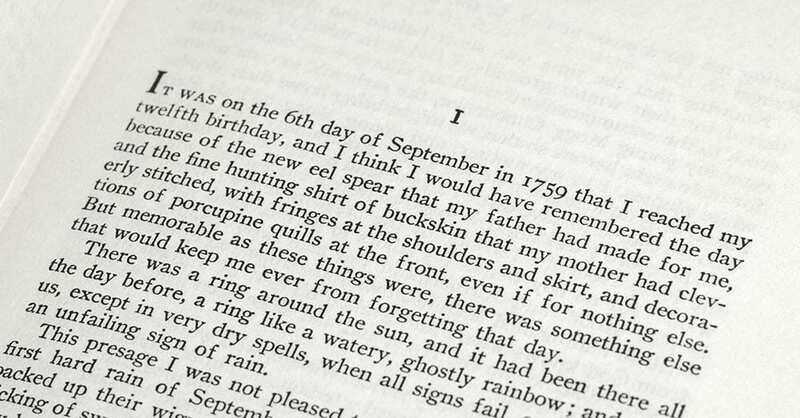 One of only one thousand and fifty numbered copies signed by the author. This is number 954. Near fine in very good dust jackets. Housed in the original pictorial slipcase which is in good condition. Black Magic: An Account of its Beneficial Use in Italy, of its Perversion in Bavaria, and of Certain Tendencies Which Might Necessitate its Study in America. Indianapolis: The Bobbs-Merrill Company, 1924. Early printing of Roberts’ work on fascism in the 1920s. Octavo, original black cloth, gilt titles to the spine and front panel, frontispiece of Mussolini. Presentation copy, inscribed by the author on the front free endpaper, “For S. D. Green with the best wishes of Kenneth J. Roberts Palm Beach January, 1927.” In very good condition.